The beaches and barrier islands of the Texas coast have provided me a lifetime of camping adventures. With options for RV, sheltered, and primitive sites, the cities along the shoreline offer beaches that are ideal for fishing, swimming, kite surfing, kayaking, bird-watching, and ultimately, wave upon wave of family fun. From family RV trips and pop-up campers to backpacking down a primitive beach, tent and rations strapped to my back, I’ve done it all on various coastlines around the country. For beauty, friendliness, variety, and accessibility, however, my preferred spots are still along the Texas Gulf Coast. While the entire Texas coastline is a beach lover’s dream, the section from the Louisiana border south to Matagorda Bay is an easy drive from Houston, which makes it ideal for Houstonians like us to make spontaneous weekend trips. Since we’ve taken up bird-watching, Sea Rim State Park in Port Arthur—with 4,000 acres of marshland adjacent to the beach—has become a favorite roost for us. We’ve camped on the beach there before, but on our last visit we arrived early enough to get one of the 15 campsites with utilities. After beachcombing and bodysurfing, we grabbed our binoculars and took a short stroll to the Gambusia Marsh Boardwalk, an ideal viewing platform for wildlife. In the marsh, we saw a rabbit and a river otter, and—because Texas is in the Central Flyway for migratory birds—we were able to spot a snowy egret, a great blue heron, and a flock of pink-plumed roseate spoonbills. Intrigued by the amount of wildlife we’d seen, we rented kayaks the next day and—using the trail map we picked up at the park headquarters—embarked on what was deemed the Moderate Trail, a 4.5-mile paddle up through the marsh and around a small lake. Again, the bird-watching was phenomenal. We saw several cattle egrets, a white ibis, two double-breasted cormorants, and both a blue- and a green-winged teal. Time flew by, and an opportunity for another beach trip presented itself. Friends who’d just bought a new Airstream invited us on the inaugural venture, and I suggested Matagorda Bay. Less than two hours south of Houston, it is one of the prettiest and most welcoming beach cities on the coast. As a campsite, we chose the RV facility at Matagorda Bay Nature Park, operated by the Lower Colorado River Authority (LCRA). There were pull-through sites with all the hookups, a small store, a kayak rental, a laundry room, and a centrally located bathroom and shower facility. Plus, the park offered the Tackle Loaner Program, which is like a library, except you borrow fishing equipment instead of books. With the fishing pier just a short walk away, we put angling on the agenda. The beach side of Matagorda Bay is clean, usually not crowded, and ideal for collecting seashells. It’s a drive-on beach, so we found a spot that suited us and settled in for the day. The water was great for boogie boarding, and we saw a number of surfers trying their luck as well. The next day we explored the nature park itself, renting kayaks from the campground and paddling into the area’s extensive wetlands. We kept an eye out for alligators while we caught sight of deer, river otters, and a peregrine falcon. The last day brought our trip to the fishing pier. We were amazed at the variety of fish that we—and our fellow fisherfolk on the pier that day—were landing. Spotted trout, gray snapper, southern flounder, red and black drum, and crevalle jack all made an appearance. We didn’t have the energy to clean and cook it all ourselves, so we drove back up the road to the town of Matagorda and had a seafood dinner at Spoonbills Restaurant. There are ten barrier islands along the Texas Coast from Galveston to South Padre Island, most of them flat, sandy, and perfect for camping. 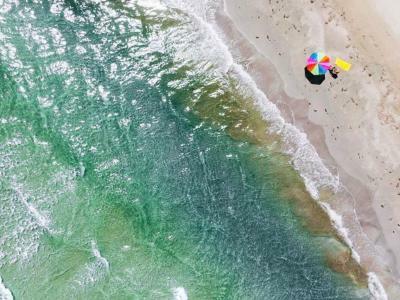 Padre Island National Seashore is the longest stretch of undeveloped barrier island in the world, a nesting ground for the endangered Kemp’s Ridley sea turtle, and our choice for a long Easter weekend trip. There were RV hookups, restrooms, and cold-water showers available at the Malaquite Visitor Center at the north end of the island, and it looked like a popular spot for families. On our quest for solitude, however, we drove down to South Beach, a 60-mile stretch that’s open to primitive camping. While there, we went wade fishing and caught two redfish, a black drum, and a pompano. Per park rules, we dug a pit in the sand that night and built a fire to cook our catch. The next morning we saw windsurfers skimming across the water. Later we went for a swim and then had a sandcastle-building contest that I let my husband win. That’s pretty much how the trip went. No planned activities, no schedules, and best of all, no stress. Every day we took long walks along the flats, spotting butterflies, squirrels, and coyotes, along with flocks and flocks of birds. Every night we had dinner under a blanket of brilliant stars. Several ancient arrowheads and hand axes have been found along the shores of Texas’ barrier islands, relics of the Comanche and Karankawa Indian tribes who lived there 5,000 years ago. Adding to that ancient treasure is a cache of 16th-century coins, bottles, and a pistol that washed ashore from the wreck of a Spanish galleon along the Texas coast.